The Queens Own (Royal West Kent Regiment) attached 16th (1st City) Bn, The Manchester Regiment, 90th Brigade, 30th Division, B.E.F. 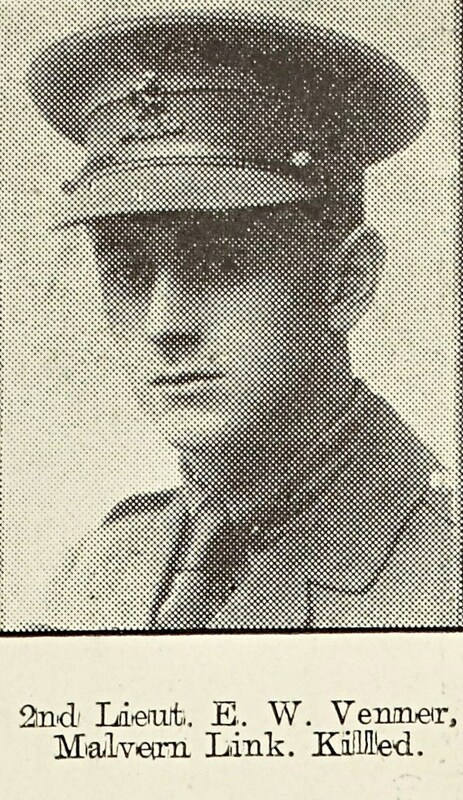 Edgar Venner was the youngest son of Mr and Mrs I R Venner, The Hollies, Malvern Link, brother to Irwin Price Venner of Mornington, Malvern Link where Edgar Venner also lived. He was educated at Worcester Royal Grammar School and both he and his brother volunteered for service in the Public Schools Bn, Royal Fusiliers. He was commissioned into the Royal West Kent Regiment in October 1915. No news was heard from him after the 9/7/16 duing heavy fighting on the Somme. He was reported missing, and presumed killed in action in April the following year. He has no known grave.